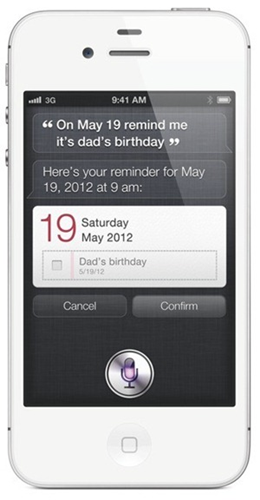 Siri was announced as one of the three major features of the iPhone 4S back on October 4th at the Let’s Talk iPhone event. It is a personal assistant of sorts, which can take input in the form of voice to perform a wide variety of tasks including things like sending emails/texts, setting reminders/alarms, playing your favorite song and answer other queries with help of services like Wolfram-Alpha, Yelp, Rotten Tomatoes and Google. This ‘personal assistant’ feature is exclusive to the iPhone 4S and, according to Apple’s official response revealed today, will remain exclusive for the foreseeable future. The news comes from our friends over at iDownloadBlog – a blog dedicated to covering iOS – in the form of a post in which they discuss an email received by developer Michael Steeber in which Apple responds to a user’s query on the potential availability of Siri on older iOS devices such as the iPhone 4 and iPod touch 4G. 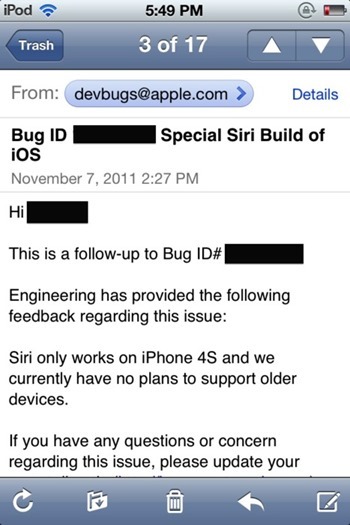 The email that was sent to Apple suggested that the company should release a special paid build of iOS 5.0.1 with support for Siri for iPhone 4 and iPod touch 4G. As great as idea as it sounds for consumers, Apple; response was in the negative, unfortunately. The first bit of Apple’s reply on how Siri “only” works on iPhone 4S is, to be quite frank, complete and utter pointless jargon. Siri has been proven to be working smoothly – GUI, voice commands, dictation and all – on not just the iPhone 4 and iPod touch 4G, but also on the older iPhone 3GS. Siri, then, can work on older iOS devices but it would be against Apple’s interest to make it available on older devices since Siri is a major exclusive feature for the iPhone 4S and one of the main reasons why people are buying it (besides the faster chip and advanced optics, of course).